In our house Peppa Pig is a HUGE favorite. All of my kids love the pig family. Peppa and George are the absolute favorites, but everyone is enjoyable in this sweet pig family. We love the adventures that the books and show take us on as a family. But this year I was incredibly impressed to see that there was a new book for the holiday season. While the book does not explicitly mention Thanksgiving, which is of course an American holiday while Peppa Pig and her creator are from the UK, the book discusses the idea of being thankful and even culminates with a dinner at the end. The idea of Thanksgiving in a universal idea; to be thankful and open to sharing our love, gratitude, and compassion with others. Although American’s associate Thanksgiving with the sharing of a meal and a special cooperation between the Puritans and the Native American’s, it is really about the American Ideal: the ability to coexist with other backgrounds and cultures while not losing anything from one’s own background. 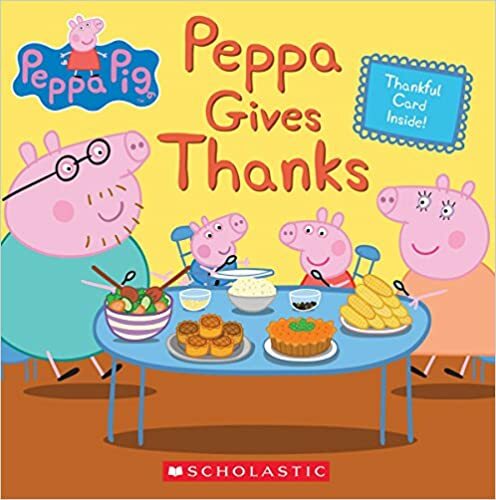 Peppa Gives Thanks allows children and parents to make a connection between being thankful and sharing all year long. It shares a meal and an idea to remind others what we are thankful for and to continue that behavior all year long. Parents and kids can even use the card at the end of the book to write down what they are thankful and grateful for. What will you write about? This entry was posted in reading and tagged best books, best boy books, Books, books that teach, books with lessons, holiday books, peppa pig, Reading, Thanksgiving, the boys store on November 1, 2018 by Lacy. It has happened again in my house, a child is ready to potty train. It doesn’t matter how many times you go through this stage — it is ALWAYS different. The last child I trained was a girl, but I have trained two boys, and I am back to training a boy now. In my experience, girls are easier. but this time around my son seems very interested in training so we shall see how it goes. In my experience having something that helps to show that the potty is not scary is a huge help. I usually give my child a doll or toy that will use the potty just like they will, and a book that makes the whole experience understandable. Each of my children loves a different cartoon character. My youngest is in love with Daniel Tiger from Daniel Tiger’s Neighborhood. 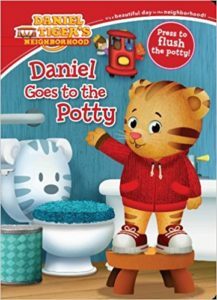 So for his book I chose to pick up Daniel Goes to the Potty. My son loves the episode when Daniel learns to go potty, and we already sing the song, so the book was an excellent addition to our new potty training routine. It follows Daniel as he learns the routine of the bathroom: “when you have to go potty stop, and go right away.” He learns the process of going potty, washing his hands, and going back to play. We love that it explains what to do when he feels the urge, since like most children, my son does not want to stop playing when he feels the need to go. It even shows what happens when he doesn’t stop to go. As we embark on this last round of potty training Daniel is along for the ride with us and we are ready to be potty trained and off to play. This entry was posted in Learning, reading and tagged books for boys, books for kids, books that teach, books to learn, daniel tiger, going potty, learning, potty books, potty training, Reading, the boys store on June 1, 2018 by Lacy. February is Black History Month. This is a very important part of our nation’s history. Many important people in history are sidelined for being a minority, but their contributions to this nation and society should never be ignored. Black History month is supposed to be a way to give light to those that have been hidden in our history. In today’s world especially we want our sons and our daughters to know that ANYONE is capable of making an impact on this world. That we are all equal in our abilities to make a difference. For decades psychologists have said how important it is to show our young girls strong female role models, but it is just as important to show our sons strong female role models. It is also important to break down barriers and show them that there is no difference between a man, a woman, and someone who may come from a different culture, or background. So this month let’s highlight a book that will do just that. Little Leaders: Bold Women in Black History highlights many women of color that have made an impact on the world today. These women have been sidelined in history, but they will not be in the here and now. Little Leaders: Bold Women in Black History highlights 40 women and the amazing thing they have accomplished. From women like Abolitionist Sojourner Truth who fought barriers and helped the fight to free slaves, to women like politician Shirley Chisholm who broke down barriers in politics serving her community in a very strong and life-changing way. 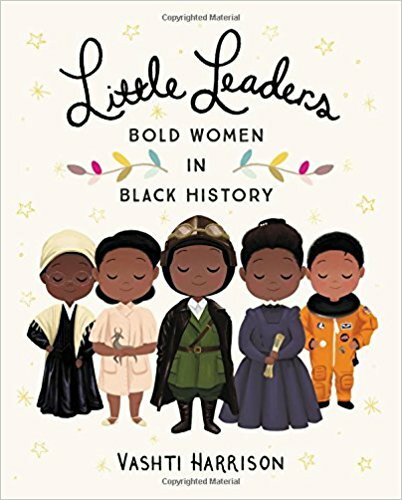 Little Leaders: Bold Women in Black History also highlights women in everyday life and how they have accomplished amazing things and shattered people’s expectations. This book is meant for children ages 8-11, but it carries an impact that could be felt by readers of all ages. Be sure to check it out, it is a book that should be read by everyone. This entry was posted in Learning, reading and tagged black history, black history month, books that teach, history, learning, little leaders, Reading, the boys store, Vashti Harrison on February 1, 2018 by Lacy.